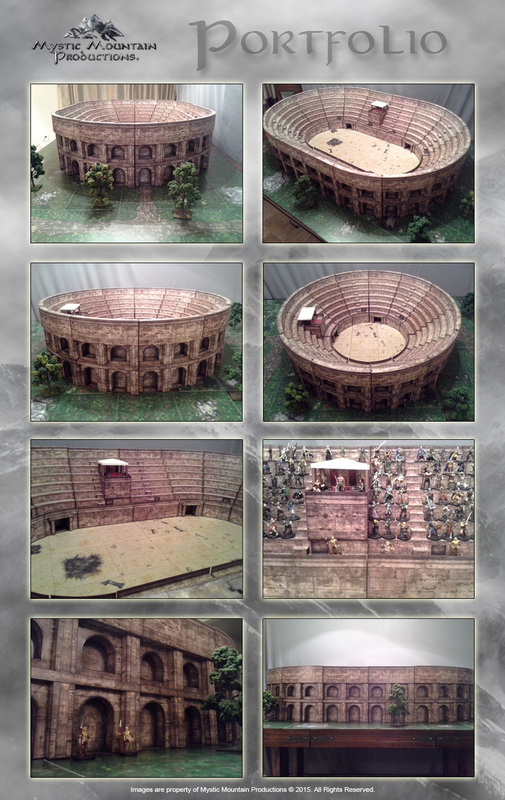 The Coliseum was designed for the best model building and game play experience possible. Each of the kit's features has been grouped into multiple PDF files where virtually every page is set up with multiple layers to customize your build. Options include straight and curved sections along with a podium and ground tiles. 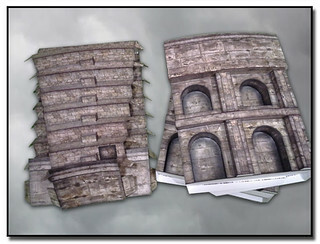 The outside walls of the main sections are available in 2D or 3D versions while the inside seating areas have optional stairs and arena entrances. The dignitary's podium is modular as well and can be placed anywhere in the seating area. Its pavilion-style roof is also removable for ease of game play. 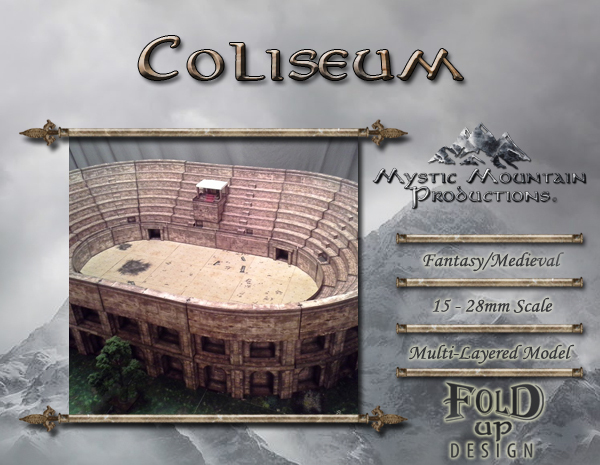 With each section being modular, not only can you use any set of ground tiles as your arena floor, but the ability to create any size and shape of Coliseum is up to your imagination! Cut files are included for those with Studio software compatible cutters. 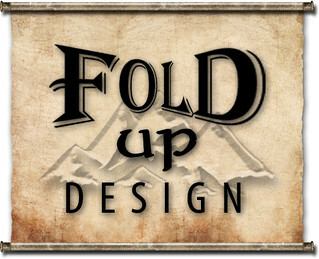 The first in our product line, the main sections can be taken apart and folded up for ease of storage. Construction is not for the faint of heart - it took me over 200 hours as I never could get the cut files to work. But...once you have it built and set the thing on your gaming table for the first time, you are in awe. This thing is over 4 feet in length and looks amazing!!! I just bought this article. The project looks really beautiful. I fear anyway there is an error in the PDF files. I mean some important images are missing, just e.g "streight 3d wall". Unfotunatly the other too. Can you please check it and then fix it? May I kindly have an answer? All of the files that downloaded on my computer have a "studio3" extension; I can't find any pdf files and my computer says it can't open it. I did a search on the internet and all I got was websites that say they can help but just want to "scan your computer" and then tell you there is something wrong that they can fix (even though there isn't anything wrong), Does anybody know how to open it, or is there some way different to download it to get the pdf files? Hey Margaret, when you first download and unzip the files you should see a folder named Cut Files as well as the 15 PDF files. You will want to make sure you have Adobe Acrobat Reader installed on your computer to view the PDF files. The .studio3 files are cut files for those people who have a CraftRobo or Silhouette cutter that use the Studio software (available free on Silhouette America's website). If you don't have a cutter machine, you can ignore these files. If you've opened the Cut Files folder you can get back to the main screen of files (including the PDF files) by clicking on the up arrow or the folder with the 2 dots next to them at the top of the list.